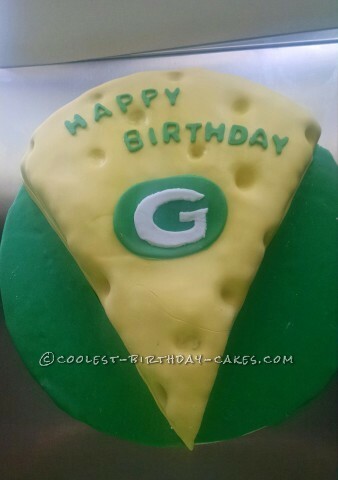 This cake was inspired by a die hard Green Bay loving fan. Coming up with it was simple. Creating it? Well that’s another story…. My boyfriend suggested using a melon scooper to ensure the holes for the Swiss cheese. Humoring him like I do most of the time, I decided to try it. Like I thought, considering I’m a little more experienced in this department, it did not work. I should have handled it myself like I always do..lol. Anyhow, I didn’t have too much of a difficult time deciding that I would probably be wasting more of the three cakes it took to bake the thing than I was actually going to use, and this excites my kids greatly when this happens. They appreciate my baking abilities…haha. I wish I had more pictures of the creation process, my kitchen always looks like a flour factory blew up but alas I do not. As this is my first of hopefully many entries, I hope to have more entertaining photos for you in the future. I hope you enjoy this cake, and attempt to create one yourself!